An interesting and mildly entertaining museum piece, this frustrating ROMpler won't be of much use to modern musicians. Light on system resources. Substantial sound library. Some decent built-in effects. Cheesy 90s nostalgia, if that's your thing. Awkward to change presets. Frustrating limitations, clunky interface. Quirky filter envelope behaviour. Few timbres meet modern standards. 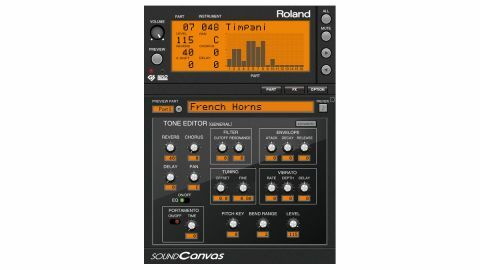 The original sound module in Roland's hardware Sound Canvas series was the SC-55, released in 1991 and sporting a broad palette of sample-based instrumental tones aiming to cover as much sonic ground as possible. Back then, MIDI was still a relatively new development, and the SC-55 was the first unit to adhere to the new General MIDI (GM) standard. GM was a big deal at the time, as it meant a GM-compatible MIDI file could play back on any GM-compatible synth and automatically trigger appropriate timbres - your trumpet would always be a trumpet, for example, even if its exact sound varied from synth to synth. The SC-55 was also the first unit to support Roland's own General Standard - GS for short - which was an extension of the original GM spec, defining more instruments and controllers. As you might expect, the Sound Canvas series was popular. However, in the grand scheme of Roland instruments, its tones weren't particularly special - certainly paling in comparison to those of the later JV/XV series. Nevertheless, Sound Canvas sounds were pretty ubiquitous for a period in the 1990s and featured heavily in many a videogame soundtrack. To this day, those primitive GM sounds remain popular in some circles - particularly in Japan - perhaps for reasons of nostalgia. Sound Canvas for iOS was released in early 2015 and now a similar offering is available to Mac and PC users in the form of Sound Canvas VA (VST/AU). It boasts all the classic Sound Canvas timbres for just about any acoustic instrument you're likely to want, plus 64 insert effects, and global reverb, chorus and EQ - all with pretty basic editing functionality by today's standards. As well as the SC-55 sound map, Sound Canvas VA includes maps for the CM-64, SC-88, SC-8820 and top-of-the-line SC-88 Pro, for flawless playback of MIDI files made for those modules. In an attempt to bring the Sound Canvas platform into the modern world, many of Sound Canvas VA's parameters are available for host automation. However, we're perplexed by some of the needlessly restrictive design choices, several of which clearly come from the original hardware. For example, the plugin is 16-part multitimbral and uses up to 64 notes of polyphony, but it doesn't support multiple outputs in the host DAW. "The layout of the pages is poorly conceived, requiring more clicks to access certain features than should be necessary." In other words, you can use multiple MIDI tracks assigned to the 16 parts, but the sounds they make can only come out of a shared output in your DAW's mixer. To mix the parts separately, you have to use multiple instances - and with Roland warning that each instance can take around 15 seconds to load, you can expect your project load times to be extended by an additional minute for every four Sound Canvas VAs used. The list of 64 insert effects includes a selection of EQs, distortions, modulation effects, reverbs, pitchshifters, lo-fi effects and processors that are really just chains of some of the other effects in the list. Happily, some of them are surprisingly good, especially the choruses. It's just a shame you only get one insert effect per instance, switched on or off for each of the 16 parts. The separate chorus, reverb and delay effects, however, are on auxiliary busses, with a send control for each part. Obviously, the global EQ isn't hugely useful, unless Sound Canvas VA is only generating a single timbre. We might forgive SC VA's interface for looking a bit dated, given the background of the product, but it also has some serious navigational issues. One annoyance relates to the way parameters are tweaked via the big orange display panel; you can't click and drag to set level, pan, key shift, delay, or chorus and reverb levels - you have to click the number and enter a value (between 0 and 127) with the keyboard. Even then, you can't simply click away from the text field, or your adjustment is lost; rather, you have to tap the return/enter key to confirm the new value. Admittedly, there are mouse-friendly controls inside the deeper editing pages, but that in some ways adds to the frustration. The layout of the pages is poorly conceived, requiring more clicks to access certain features than should be necessary - we can't fathom why Roland didn't just use a simple set of tabs, at the very least. Ultimately, Sound Canvas VA isn't a plugin that's likely to appeal to most contemporary producers. Even if you're interested in the Sound Canvas instrument tones for their nostalgic value, you're likely to feel frustration at some of the design choices made here. Honestly, it feels like a low-effort attempt from Roland to virtualise one of its classic hardware synths, and we seriously hope this isn't the extent of its capabilities in this area.